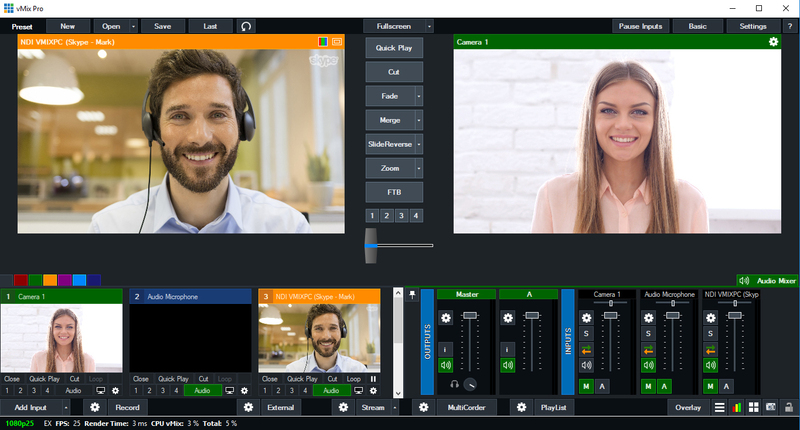 Using vMix and the latest version of Skype, it is possible to bring in a Skype caller from the same PC as vMix and also send them a return video and audio feed. Open vMix and go to Settings -> Outputs/NDI -> Then next to Output 1, tick the NDI button so it is green and says NDI On. Next click the cog icon to the right of this and select BusA from the Audio Channels dropdown menu. This will enable the NDI output from vMix with BusA audio included. Using Bus A audio means we can control what audio is sent back to the Skype Caller - to avoid any audio feedback. Next go to Settings -> Audio Outputs -> and set the Bus A option to Enabled. Open the NewTek NDI Virtual Camera program that comes installed with the Newtek NDI Tools pack. Once running, click the arrow in the task tray at the bottom right of Windows and right click the yellow and black NDI icon. Select your computer name -> then select vMix - Output 1. Open Skype and click on the 3 dot menu button at the top left. Then select Settings. In the new window that appears, select the Calling tab. Then select Advanced. Next, click the button to the right of Allow NDI usage to enable it. Speakers - turn this down to 0. This will ensure you don't hear the Skype audio twice as you will be listening from vMix. Open vMix and go to Add Input -> NDI / Desktop Capture -> NDI. 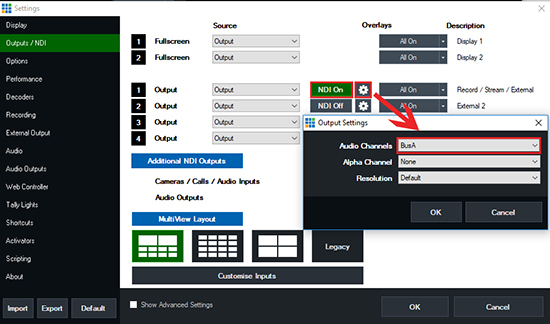 Then select the Skype NDI input that appears in the list and press Ok.
Activate the A bus button on all other audio inputs you want your skype caller to hear, such as your own microphone. Make sure you do not activate the A bus button on the NDI Skype Input so the caller doesn't hear themselves.